1. Preheat your oven to 190°C, gas mark 5. Lightly dust a clean surface with flour then roll out the pastry to the thickness of a £1 coin and large enough to line a 23cm loose-bottomed, fluted tart case. Lay the pastry into the tart case with the excess pastry overlapping the sides, line with crumpled baking parchment, fill with baking beans and bake for 30 minutes. 2. Remove the baking beans and cook the pastry for a further 5 minutes to ensure the base is cooked. Remove from the oven, trim the edges and leave to cool. 3. Melt the butter in a medium frying pan over a medium-high heat. When bubbling, add the bacon and onion. Fry the ingredients, stirring regularly for 10 minutes, by which time the onions will have softened and caramelised. Tip the mix onto a plate and reserve. cooling quickly under cold water. 5. Cut each spear to fit into the tart case from the middle pointing out. Slice up the trimmings and reserve. 6. Scatter the cooked onion and bacon mixture in the base of the tart, arrange the spears in the case following the pattern of a clock, and scatter the sliced trimmings evenly into the base too. 7. 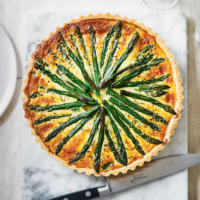 Beat together the eggs and double cream, and slowly pour the mix into the tart, trying not to disturb the asparagus. 8. Slide the filled case into the oven and bake for 30-35 minutes, or until it’s just set with the merest hint of wobble on the tart surface. 9. Remove the tart from the oven and leave to cool a little before slicing into wedges and serving with watercress. This recipe was first published in Tue Apr 19 08:53:00 BST 2016.